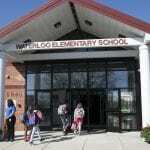 Waterloo Elementary School (Columbia, MD). Waterloo Elementary School’s social studies curriculum actively engages students by interacting with a variety of resources and demonstrating learnings through various performance-based assessments. The students explore a variety of social studies curriculum topics (e.g., Money Matters, Project Citizenship, Changing Communities, and Mapping Our World.) The culminating project occurs in 5th grade in an activity, Simulated Congressional Hearings (SCH). Throughout the year, 5th graders study four units of instruction: The American Revolution, Building a New Nation, Challenges of a New Nation, and We the People. SCH provides an opportunity for students to work collaboratively as they simulate participation in hearings associated with interpretations relating to the Constitution. Students assume the role of constitutional experts on topics they have been learning. Students appear before a panel of civic volunteers and justify their interpretations of Constitutional influences during debates focusing on current event topics. Student groups are evaluated on: understanding, constitutional application, reasoning, supporting evidence, responsiveness, and participation.